Big wooden box that makes noise. The Norwegian Pattern Rotary Fog Horn. By turning the handle on the side it fills up with air and starts producing sound. 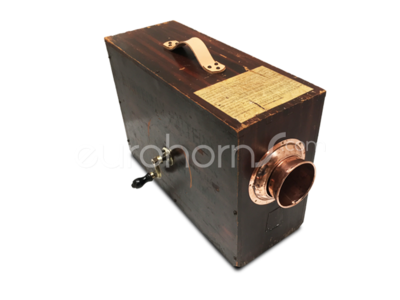 This originally 19th century invention, is a boxed red copper fog horn. This so called Norwegian Pattern fog horn is manually operated by the handle on the side. By rotating the handle, the belows inside the box will fill theirselves with the air needed to operate the horn. This system enables the horn to continuesly sound. We restored the horn, to make it work again, but left it as original as possible. In the attachment you will find a copy of the original "directions for use".